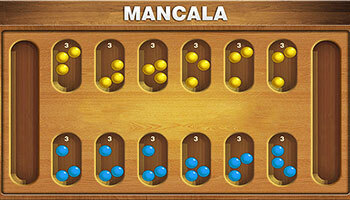 Mancala is an ancient family of board games and there are numerous variants. 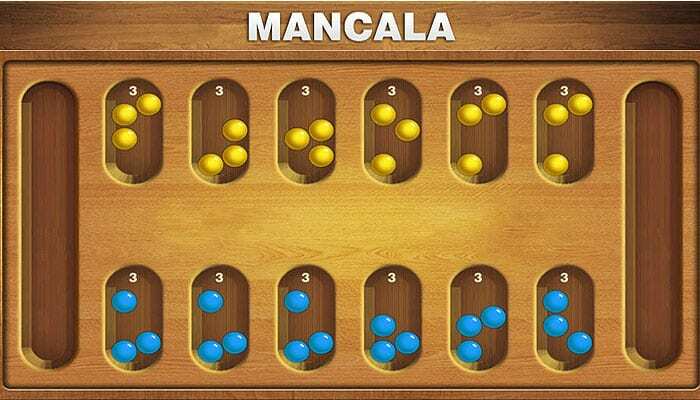 Mancala is generic name for a group of games that all share the same game mechanics. The boards and rules differ among regions, but the strategy is basically the same. 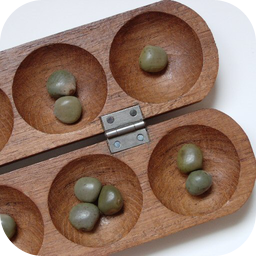 The basic game, known as two-rank Mancala, is also known as Kalah and is for two players. Depending upon where the game is played, the game has been given many names names that refer to the manner of winning, the mode of play, the board used or the counters used. Players move alternatively in a series of "laps". During a turn, a player removes all of the stones from one cup or hole and then places them one by one in the cups around the board in a clockwise direction. 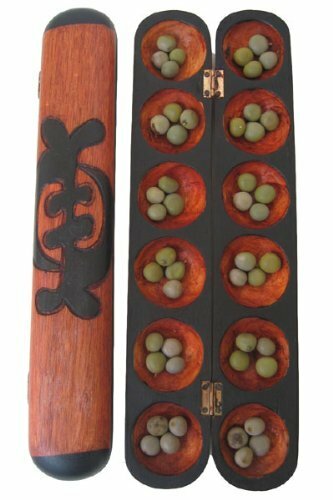 The long holes at the ends of the board are called mancala and each player owns one of them. A player can place a stone in his mancala but never in his opponent's mancala. 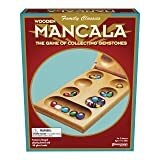 To capture stones, you need to place the very last stone of your turn into an empty cup on your side of the board which then captures all stones that are directly across on your opponents' side are then captured and placed in your mancala. The game ends when one player has no stones on his/her side of the board. The oppenent then places all stones that remain on their side in their own mancala. The biggest positive to this game in my mind is the ease of play. From young to old and never played before, the game is very easy to pick up and play. The player's strategy is dependent upon ability to reason and count. Winning is based upon a player's ability to claim or capture an opponent's game counters. Even while it is easy to play, there are still many layers of strategy to this game. Can you set your self up to keep getting extra turns or do you go for trying to capture your opponents pieces by landing in an empty hole on your side? Either way you will be doing a lot of counting in your head to try and figure out how to win! Regarding tactics and strategy, this game does a fantastic job of introducing the two concepts in a way that is easy to grasp. Mancala games are often won with the smallest margin. One extra stone in your mancala can make the difference to win or to lose. As the first player, you should start with the 3rd hole as opening move as your last stone will land now in the mancala. This not only scores you a point but gives you a second move. 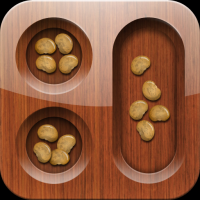 Mancala is, in every sense, a game of pure skill and strategy. Each sowing must be calculated in terms Of how it affects your ability to capture the stones in your opponent's cups and in terms of how it affects your opponent's ability to capture the stones in your pits.